Last Saturday was the 4th Annual Riverfront Park Ski Trip. 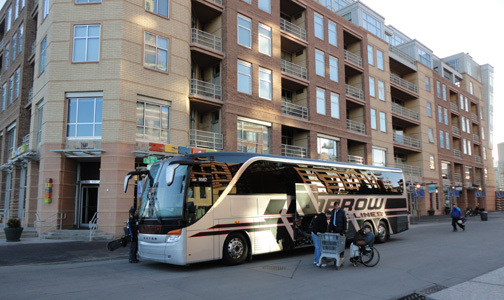 I’m so excited that 50 residents of the neighborhood took a chartered bus to Copper Mountain. The first two years we were able to take the Ski Train up to Winter Park for a wonderful day of skiing. We hope in the future that option comes back, but for now it gives us the opportunity to ski at different resorts. The event is organized by the Riverfront Park Social Club and is funded by the Riverfront Park Community Foundation. After we returned to the neighborhood we had a Happy Hour at ZENGO to finish a great day with our friends. Throughout the year, the RFP Social Club hosts many fun events for our residents including outdoor movie nights, the block party and a holiday party. It’s a great way to promote community within our neighborhood.